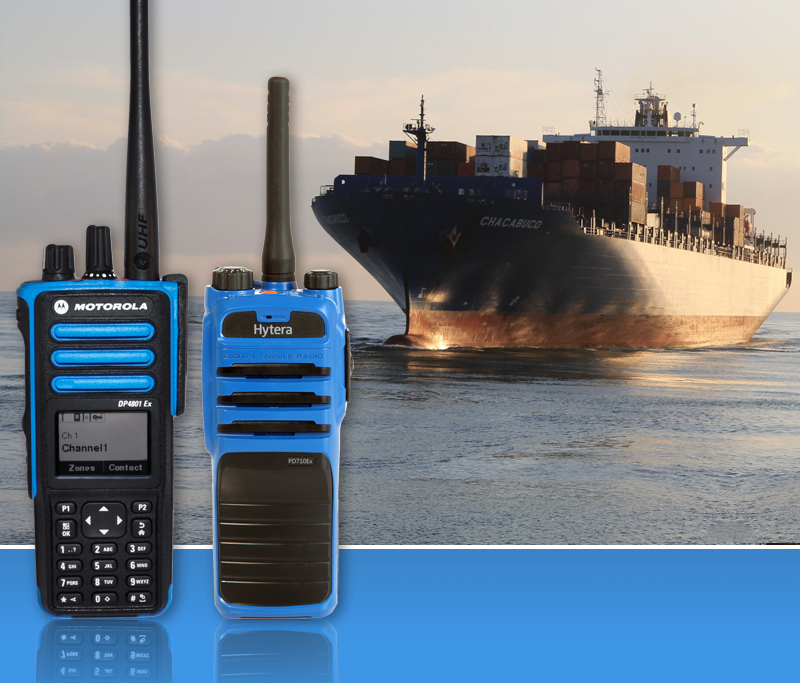 A new directive regarding on-board safety protocols for ships has set a minimum requirement for the number of two way radios which must be carried at sea. The new Safety of Life at Sea (SOLAS) regulations, brought into force in July 2018, now require every ship to carry a minimum of two handsets per firefighter team. The two way radios must meet ATEX standards which govern electrical ignition protection in environments where there is a risk of explosions. For ships constructed on or after 1 July 2014, a minimum of two two-way portable radiotelephone apparatus for each fire party for fire-fighter´s communication shall be carried on board. Those two two-way radiotelephone apparatus shall be of an explosion-proof type or intrinsically safe. Ships constructed before 1 July 2014 shall comply with the requirements of this paragraph not later than the first survey after 1 July 2018. In practice, this directive means that all ships operating in European waters or out of EU ports must carry ATEX-compliant two way radios. ATEX is a term used to refer to a couple of EU regulations governing the management of risk in explosive atmospheres. When applied to electrical equipment, ATEX means devices that have been built to be ‘intrinsically safe’ – in other words, there is no risk of them giving off a spark which could cause ignition in a high-risk environment. ATEX two way radios are organised into different classes, depending on the level and type of risk in the environment they are to be used in. As well as intrinsically safe spark protection, for example, some are built to guarantee low operational temperatures to further minimise the ignition risk. Other elements common to all ATEX radios are an advanced set of safety features and functions. As well as emergency alert and override options to ensure urgent calls can get through and alarms can be raised, many feature GPS location services to help colleagues keep track of the movements of emergency response teams. There are other practical features, such as bright casing so that handsets can be easily located in dark environments, and non-slip chassis so devices can easily be handled when wearing gloves. Examples of ATEX radios include the likes of the Motorola DP4401 EX, Motorola DP4801 EX, Hytera PD715 EX and Hytera PD795 EX. For further advice on which class of ATEX two way radios are best suited to on-ship environments and fire safety, please contact our friendly and experienced team today on 01245 403520.